As we prepare to attend the Underwater Technology Conference – UTC 2011 – in Bergen, we’ve found it useful to keep in mind that a significant aspect of the event will be to examine how operators and suppliers can leverage the continuous innovation that’s taking place on the Norwegian Continental Shelf, the North Sea and other oil provinces around the world. Following that thread, we’ve included an article from Trond Olsen, the Chair of the UTC Programme Committee and the General Manager of the Norwegian Centre of Expertise for Subsea, who tells us about NCE Subsea’s efforts to promote the efforts of the Bergen subsea cluster. Operators and suppliers from the NCS have contributed greatly to the development of subsea innovation that has found its way around the world, and NCE Subsea has been a key participant in making that happen. We also have a subsea market report that outlines not only oil and gas developments, but describes a “gold rush”, in which traditional subsea applications are being applied to offshore energy generation, providing, for example, subsea power grid cabling for as wind farms. Subsea technologies have long moved far beyond the range of human divers, and from AAK, we hear about how AAK Subsea has worked to meet subsea challenges through the development of a 200-horsepower ELSUB electric work class remotely operated vehicle (ROV). Looking across the Atlantic, we also include an exclusive interview with Kjetil Hove, Statoil’s country manager in Brazil, who talks about first oil at Peregrino field, as well as the Campos basin, outlining some of Statoil’s targets in Brazil. Peregrino posed a number of challenges, and Statoil’s solutions make fascinating reading. 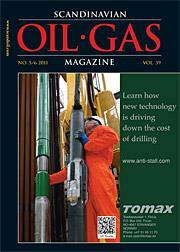 This issue also includes a focus on gas, and we hear how Wintershall foresees a bright future in the gas market. E&P operators, carriers and the supply chain are witnessing a stronger demand, and pipelines are being planned and gas carrying ships are again on order. From UniversalPegasus, we have a report that speculates about how the US could leverage its growing gas supplies to become an exporter to Japan and Asia. And that’s only a start – there’s more to find as you turn the pages. Early in May we attended the annual OTC in Houston. This year’s event was upbeat, with a positive, optimistic atmosphere. Our look back at the event spotlights a few of the conference and exhibition’s highlights. As we go to press, Nor-Shipping is underway in and around Oslo. We’ve got a quick look as the opening of the premier maritime industry event. And our next issue will have even more from Nor-Shipping, which this year includes a new focus on the industry’s involvement in oil and gas activities – Agenda Offshore. We wish everyone a good start to your summer. We’ll be busy preparing the upcoming July/August issue that we’ll be taking along to Offshore Europe in Aberdeen as well as the new conference from OTC – OTC Brasil – in Rio de Janeiro. Drop us a note if you have something you’d like to include in the upcoming issue. Your welcome to join us!